Understand Depression Symptoms and get help to ovecome it! Does getting out of bed in the morning feel impossible for you? Understand depression symptoms and get help to lift depression fast. Effective and safe therapy that help you to step out of depression, get your energy back and feel better fast. Book a session today (face-to-face or online) and begin your journey to a healthy happier life. Is it all in my brain? My genes? Will I have to keep this fake smile all my life? Will I have to keep taking pills that just make me feel numb to the world and give me side effects? Ok, here are some words about myself. Once you have a clear picture of what depression is and what causes it, you can start to take control of it. Many of my clients report a positive change already after the first session. My aim is not only to lift depression as fast as possible, but also to empower you with the tools to keep depression at bay in the future. But of course, depression doesn’t disappear overnight. Below I outline some basic strategies that we will work on together. I use hypnosis to deeply relax the exhausted brain, to rehearse new behaviour and to create change in the instinctive (unconscious) part of your brain. Book a session today and begin your journey to a healthy happier life. Just fill in your email address, join our email list and we will send you the "Good Times" MP3 right away. Why am I depressed? Knowledge is power. 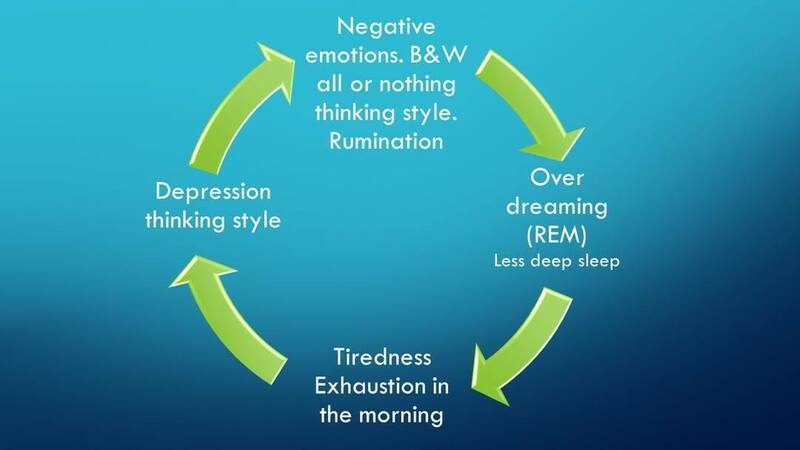 Below is a more in-depth explanation of the cycle of depression. it will help you to understand depression symptoms and the steps to step out of it. I know it can look a bit much. Especially if you are stressed or exhausted it is hard to take in information sometimes. Don’t worry, if you just get the gist of it that’s fine. It is here to give you a basic overview and we will walk through it in the session. To understand and treat depression we need to look at a bigger picture. Breakdown of the extended family and community creates feelings of isolation. (In closed societies like the Amish in the US or remote tribes in New Guinea depression is unknown). High-stress levels for a long period of time, creating an increased amount of stress hormones. Negative explanation of the self and of events in the world. (This can be learned from parents/caretakers, and is the reason why depression ‘runs in families’). Excessive worrying and ruminating on thoughts of the past. An increased focus on material wealth. Overwhelming negative information presented in the news. Unrealistic expectation and standard presented in the media. I have noticed so much change in my life since my session with Etai, I gained confidence and am able to be in public settings without anxiety or panic setting in. I have found ease around meeting new people and gained strength in facing others. Thank you so much for your guidance and your gift of healing. I have joined a local gym again and am getting back in shape, I used to be a runner and cardio kick boxer but after the accident I lost interest in things important to me. I have found the confidence to rejoin these activities and it feels amazing! How does the cycle of depression work? Having a good night’s sleep is important for our wellbeing. We all dream every night, yet people have asked why we dream since the start of humanity. One of the reasons that have been found recently by scientists like Joe Griffin from the Human Givens Institute is an unfulfilled emotional expectation that we accumulate but don’t fully resolve. does that mean? Well, for example, if you are worried about something but then either calm down about the situation or actively problem solve, then you have completed an emotional circuit and your brain is clear, it is resolved. If you don’t manage to relax or problem-solve, then those worries will need to be completed and ‘flushed out’ which happens naturally through the REM state while you’re dreaming. While dreaming (REM state) the brain is very active, similar to awake times, and it stops producing serotonin ( a feel-good hormone) which is responsible for moods, pain control and motivation to move. A depressed person will have more dream time and less deep calm sleep. Deep calm sleep is responsible for the recuperation of the body and immune system. In the morning the person will wake up feeling exhausted, lacking motivation and with physical pains. This will cause more negative thinking and worrying, more emotional arousal and so the cycle continues. “Since you have seen my descent, come and see my rise. Let’s look a bit deeper into that cycle. People that suffer from depression will miss most or all of those basic needs, in some cases they will try to meet them in an inappropriate way eg. overuse of alcohol or overeating. 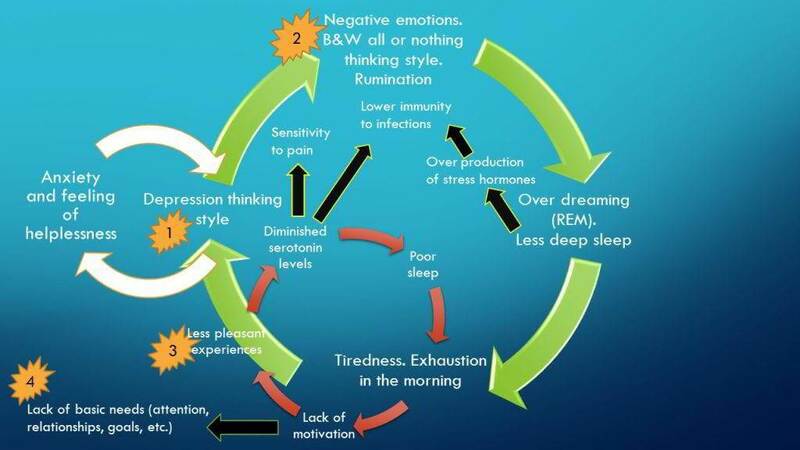 Below is a more elaborate version of the cycle of depression. As you can see depression affects many aspects of your life and creates additional downward spirals (marked by the different coloured arrows). It is enough to look at this diagram to get overwhelmed! Not to worry, I would mainly like you to notice the orange blobs that represent where we can begin to create change. Is online therapy not suitable for you? Well, that’s difficult to say before starting work with you but international guidelines for the treatment of depression state that the client should experience a significant improvement within 6 sessions. I always aim to make a difference as quickly as possible in the way that you feel day-to-day and that is often after the first session. The evidence is that effective psychotherapy is more effective than drug treatments in preventing relapse because in good therapy you learn what is causing the depression and get strategies to ensure it doesn’t return. Once you understand how depression works, you are in a much better position to prevent its return. I'm on antidepressants - can you treat me? As long as you tolerate the antidepressants well – in other words, they don’t make you feel radically different to how you normally feel as a person when not depressed – that’s fine. It can be tricky if they are really having a strong effect on your psychology though, in which case you might want to speak to your doctor about whether it is appropriate to lower your dose before coming for therapy. Throughout the years I’ve seen countless people who regain their life. They got their energy back, found new interests and built better relationships. Book a session today and begin your journey to healthy happier life.